Building on Versatile Tools and Specialized Tools, I’d like to talk today about a situation commonly encountered by new woodworkers in which a specialized tool is often recommended. I’m always surprised at the perceived difficulty of planing end grain. In my many years of woodworking, I’ve had the opportunity to use a wide variety of hand planes, and I’ve used almost all of them successfully to plane the ends of boards at one time or another. Still, time and time again I talk to new woodworkers who are under the impression that they need a special plane in order to accomplish this simple task. The end grain of this eastern white pine board was planed with an English coffin smoothing plane with a bed angle of 47½°. The resulting surface was as smooth as glass. I’m not sure where the myth that a low cutting angle is required for planing end grain originated, but the explosion of low angle plane models from modern manufacturers has certainly helped to propagate it. I have nothing against these styles of planes (I own a Lie-Nielsen low angle block plane). On the contrary, I think they’re extremely fine tools and I see no reason not to use them if they work for you. However, in terms of a low cutting angle being required to plane end grain, I’m afraid it’s just not the case. Let’s talk about the cutting angle for a minute and what it means in the hand plane world. The cutting angle is the acute angle between the wood’s surface and the cutting edge of the blade. This angle is determined by the angle of the bedding surface of the plane and the angle of the cutting face of the blade. In a traditional bevel down plane, the cutting face of the iron is the flat side. In a traditional bevel down plane, since the flat face of the blade is parallel to the bed of the plane, the cutting angle is equal to the bed angle of the plane (unless the blade is back beveled, but that’s a topic for another time). So a traditional bevel down plane with a 45° bed angle would also have a 45° cutting angle, regardless of what angle the bevel of the blade is sharpened at. The cutting angle of the low bed angle bevel up style planes is determined a bit differently. In these planes, the cutting face is the bevel of the blade. Therefore, the cutting angle is defined as the sum of the bed angle of the plane and the bevel angle of the blade. So a modern low bed angle bevel up plane with a 12° bed angle and a 25° bevel angle would have a 37° cutting angle. If you increase the bevel angle of the blade to 30° (probably the most common honing angle), the cutting angle will increase to 42°, which is very close to the cutting angle of a traditional bevel down plane. The ability to change the cutting angle of the plane by changing the bevel angle of the blade (or swapping out blades with different bevel angles) is the main selling point for the low bed angle bevel up planes. Traditionally, bevel down hand planes came in a range of cutting angles or pitches. Common Pitch was used to describe the most common cutting angle. In American made planes, common pitch was traditionally 45°. In English made planes, common pitch was typically 47½°. York Pitch was a slightly higher cutting angle, usually around 50°. Slightly higher than York pitch, at 55°, is Middle Pitch. Higher still is Half Pitch or Half Upright Pitch (meaning half way between common pitch and upright pitch) at 60°. Pitches higher than 60° are rare and are sometimes called Upright Pitch. Anything above 70° is basically a scraper. So if you wanted to change the cutting angle of a traditional bevel down plane, you needed a different plane. In the 18th century, the closest thing to what we would call a low angle plane today was the strike block. These were typically bevel down planes bedded less than 45°. Because all planes were made of wood at that time, it was extremely rare to find a bevel up version with a very low bed angle like we see today because they just weren’t strong enough to handle the wedging forces across the grain that would be required to secure the blade. Bevel up configurations with very low bed angles in wooden planes make the cheeks very fragile and subject to splitting. It’s not until very late in the 18th and into the 19th century that bevel up style planes begin to become more popular with the advent of iron bodies. These planes were often called miter planes. “you need a low cutting angle plane for end grain”. I won’t argue the fact that the lower cutting angle of the bevel up planes can make them a little bit easier to push through the end grain of some woods. However, the notion that these planes are required for such work is completely untrue. I have used old wooden bevel down planes with cutting angles from 45° up to 55°, and traditional iron bench planes with 45° cutting angles to plane all species of end grain for years and have never run into a situation where these standard or high cutting angle planes couldn’t do the job. The end grain of this incredibly dense piece of mahogany was planed with an ordinary #4 sized iron smooth plane…and those are end grain shavings, not dust. 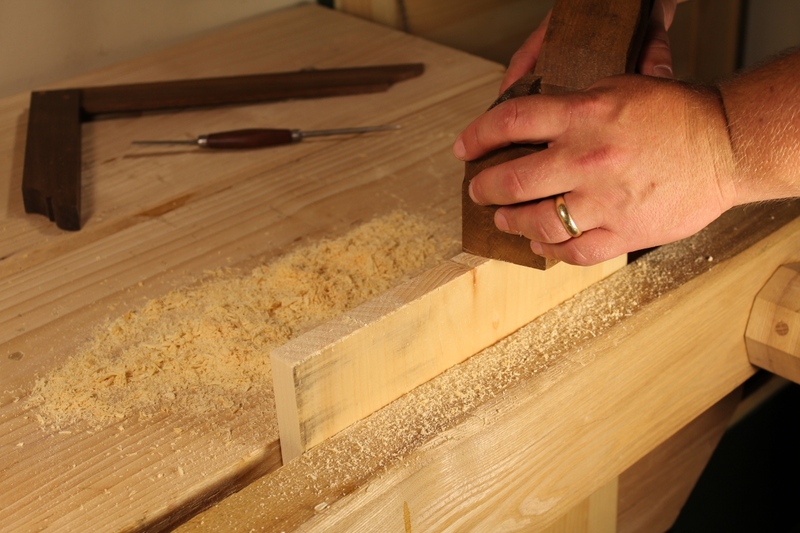 If you’re having trouble cleanly planing the end grain of a board with a traditional bench plane (either in the vise or on the shooting board), the problem isn’t the cutting angle of the plane. The culprit is the blade. 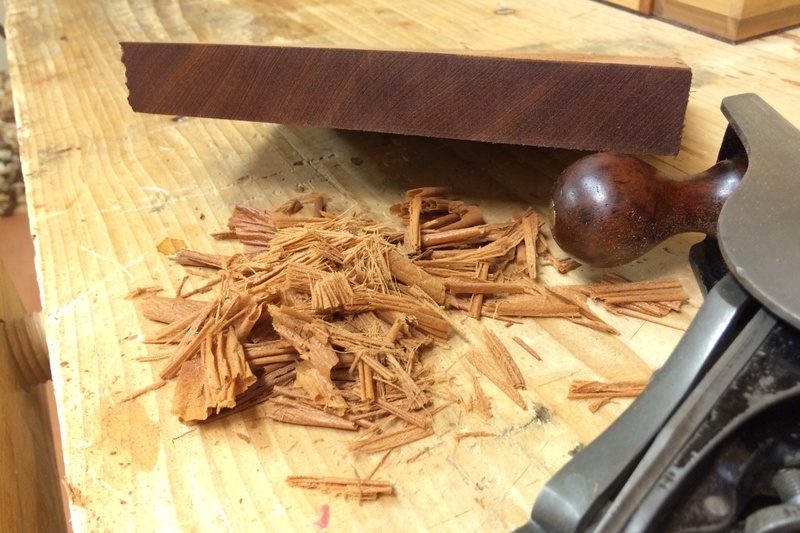 The only secret – if you can call it that – to planing end grain is a sharp blade. The size of the plane’s mouth is irrelevant. The chipbreaker position doesn’t even matter. What matters is that the blade is sharp. Not kind of sharp, but as sharp as you can get it. Ultimately, you should use whatever planes you want. They’re all fine tools when they’re well made. But if you’re on a limited budget, you shouldn’t feel like you have to get yourself a special low cutting angle plane in order to be able to use a shooting board or plane the end grain of boards. Just use whatever plane you have. The sides of the plane don’t even need to be square to the sole (that’s a myth for another day). If you are having trouble planing end grain with your current plane, don’t assume you need a different tool, work on your sharpening instead. Posted in Hand Planes, Sharpening, Tools and tagged end grain, shooting board.